Dump truck can haul 8 ton of rock, 8 cubic yards of soil or 10 cubic yards of mulch. Come pick out your landscaping products and take them home with you. We are located at 10901 South 14th Street, Roca, NE 68430 (2.5 miles south of Pine Lake Road). We have loaders and employees ready to assist you with whatever amount of material you need. Don’t have a trailer to get the materials home? Trailer rental is $25.00 every 2 hours or if product total exceeds $100 in one trip, the two hour trailer rental fee will be waived. They have a push button dump system to make unloading fast and easy. 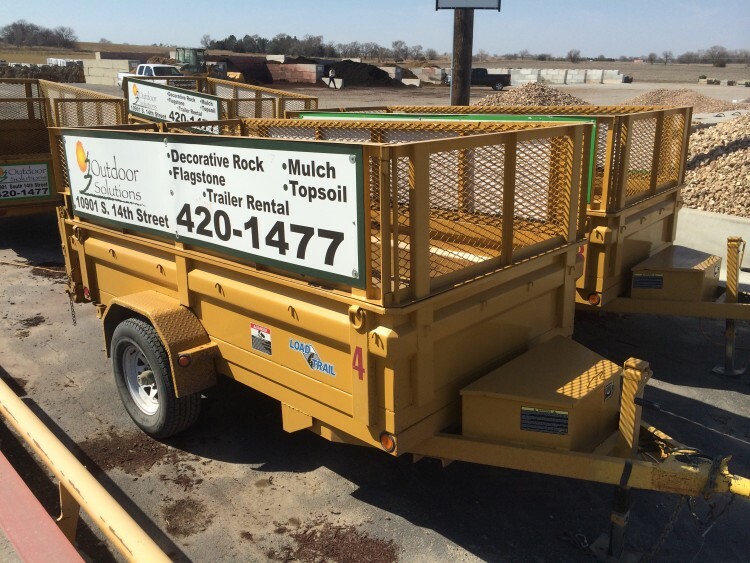 Trailers are to be used for hauling purchased materials from Outdoor Solutions only. Capacity: 4000 lbs. of rock/ 2 cubic yards of soil/ 6 cubic yards of mulch. Outdoor Solutions has the right to decline use if customer vehicle is not suited to safely pull trailer.